"What do I have in common with the Jews? I don't even have anything in common with myself." Nothing could better express the essence of Franz Kafka, a man described by his friends as living behind a "glass wall." Kafka wrote in the tradition of the great Yiddish storytellers, whose stock-in-trade was bizarre fantasy tainted with hilarity and self-abasement. What he added to this tradition was an almost unbearably expanded consciousness. Alienated from his roots, his family, his surroundings, and primarily from his own body, Kafka created a unique literary language in which to hide away, transforming himself into a cockroach, an ape, a dog, a mole or a circus artiste who starves himself to death in front of admiring crowds. David Zane Mairowitz's brilliant text and the illustrations and comic panels of the world's greatest cartoonist, Robert Crumb (himself no stranger to self-loathing and alienation), help us to understand the essence of Kafka and provide insight beyond the cliche "Kafkaesque," peering through Kafka's glass wall like no other book before it. 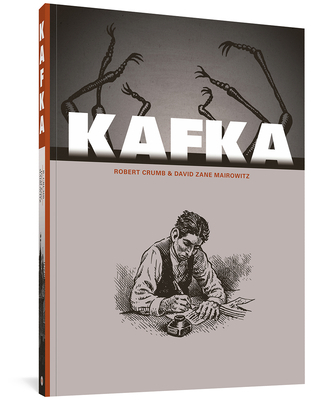 The book is a wonderful educational tool for those unfamiliar with Kafka, including a brief but inclusive biography as well as the plots of many of his works, all illustrated by Crumb, making this newly designed edition a must-have for admirers of both Kafka and Crumb.